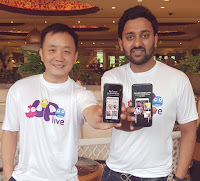 After achieving success in Greater China, Middle East and North Africa (MENA), South-East Asia and the Americas, Uplive has witnessed tremendous growth in India since the beginning of 2018. Uplive, an offering from Asia Innovations Group (AIG), also an innovative leader in the mobile interactive entertainment space, headquartered in Hong Kong with 14 offices worldwide, has become the top mobile application in this segment globally. Launched in May 2016, Uplive is a live-streaming platform that allows viewers to broadcast and view real-time videos via their smartphones. The platform’s unique blockchain protocol will enable users the ability to send virtual gifts to content creators, which can then be exchanged for money. Currently available in over 100 countries and with 500,000+ monthly broadcasters and over 60 million users worldwide, the app currently supports sixteen languages including English, Hindi, Arabic, Chinese, French, Portuguese, Spanish, and Thai. With an addressable market size similar to China, Uplive has been the fastest growing live streaming app in India for the past couple months, with 100,000+ new Indian users registering Uplive per day. Among Uplive users, India is pegged to become the most significant player in a couple of months, and the AIG group will focus its resource on this critical market in the form of setting up a regional headquarter and an operations center. AIG’s offering is wider than Uplive: as a social entertainment platform, AIG is going to roll out in India a series of video-based social apps such as short video platform and game broadcast. The group aims to build a next-gen social platform for the market, and it has a long-term vision with the Uplive ecosystem. Uplive firmly believes that it is the most opportune time to enter the Indian market with 4G penetration and data price that is suitable for the Indian masses. It presents a massive employment opportunity for skilled, semi-skilled professionals and even amateurs who can become content creators. Also, Uplive plans to make “live streaming” a mainstream social media format in India by using its global formula of combining revenue collection with real-time interactive entertainment. Eventually, it aims significant revenues to be generated from India. The sustainable development of Uplive depends on its ability to integrate all kinds of social entertainment features together as well as the improvement of contents. Uplive is currently available in both Android and IOS versions for download.